Slight malt Sweetness with notes of dark chocolate, espresso and herbal hops. A - Nice ruby brown body with an excellent one finger head. Select bubbles in this tan foam topping. S - Lots of roasty caramel and burnt brown sugar. Sweet vanilla notes and a hint of syrup covered tobacco. Some oak scents in this very rich nose. T - Nice heavy caramel/brown sugar bite. Some syruppy molasses and burnt toffee here. Sweet and roasted dry. A background of oak and vanilla bean. M - On the heavier medium side this one has the perfect body to match this flavor profile. Smooth, silky and soft. O - A really great porter this beer is complex and rich. A very well rounded flavor with a great balance. Don't be fooled by the BA score of 84. This is literally a perfect porter. The first time I had it, it blew me away. The second time I had it I got it on tap at a bar and it was even better. Smooth and chocolatey with a roasted coffee aroma, it was nearly too beautiful to drink. As the beer warmed up the flavours became even more pronounced. This beer is beyond a score of 84, I'm not exactly a 'beer expert' but I know that everyone I know who has had this porter has raved about it. Go out and give it a try. Look: Struck me as being rather light for a porter - dark, translucent brown with some nice ruby highlights. Fairly thin, bubbly head with good retention. Not much in the way of lacing - some, but not much. Smell: My immediate thoughts were that it smelt a bit like a watered-down version of Sam Smiths Chocolate Stout. Perhaps a bit unfair, but a fairly good point of reference. There's quite a chocolatey aroma, along with some coffee notes and the barest hint of hops. Roasted malt smells, if they were there at all, were not evident. Taste: More coffee than chocolate, with a bit of zing from the hops. There's a hint of slightly medicinal herbs too - think in terms of liquorice or sasparilla - it doesn't dominate by any means, but it's just 'there' and enough to add a bit of extra interest. Feel: Medium body with fairly light carbonation - the coffee and chocolate flavours make it feel a bit 'chalky' in the mouth, but the flavour profile makes up for it. Nice bitterness in the finish. Overall: Another win for Left Hand in my book - it doesn't displace their Milk Stout as my favourite Left Hand brew but as porters go this is a mighty good one. Pretty standard porter but does lean to the sweet side. Definitely enough roasted malt to balance it out but it still skews a bit sweet for my taste. Body and feel are very nice - the nose on this is a nice standout. Appearance- Pours a charcoal brown. Two finger head that dissipates fast. Opaque. Taste- Bready, roasted malt. Earthy flavor. Not heavy on the chocolate malt flavor but the expresso like flavor builds steady. The coffee bean taste lasts into the finish leaving a dry and bitter taste on the palate. Mouthfeel- Medium in body, active carbonation. Overall- Not bad. This one wasn't too impressive as it could have had a better malt profile. The expresso quality was bold and this is on the hoppy side for a porter which was interesting. Weak watered-down brew, with no backbone. 05-01-07. The pour produced a creamy light tan head of approx. 1". The beer is a dark mohogany with ruby color when held to light. The head dissipated to a thick cap leaving sparce lacing. 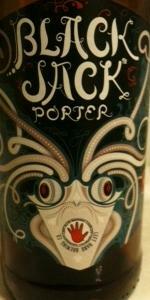 The nose was typical porter with malty/chocolate sweetness. I give it "above average" due to the pleasant smell and the abundant aroma. The taste is also quite good. It is right on style for a porter with hints of chocolate and a malty sweetness. Just a tinge of hop bitterness at the end. Mouthfeel: Just a bit thin for my taste.... not too robust.... but a good porter none the less. Drinkability: Not my favorite porter... but not bad.... I will have more of these and would recommend them. Mostly black - red deep hues / moderate head. Sweet roasted chocolate deep malt. A little balancing hops. Sugary sweet rich fruity. Sweet thick malt - sugar and roasted burnt semisweet chocolate espresso, roasted barley type earthy woody bitterness. Hops give significant bitterness, floral herbal slight spice. Creamy medium body, light carbonation. Pretty good. Easy to drink, rich and deep. Good subtle complexities. Dark roast, raisin/dark fruit caramel/molasses tones - quite nice. Very dark caramel brown, mild head. Creamy, creamy mouthfeel - top notch. Lots of deeply roasted malt flavors come in to play along with dark sweet notes and bright fruit. Caramel sweetness really hits the spot. Finish is ripe with hop and roasted malt/barley bitterness. Raisin dark fruit tones materialize. There's a lot going on here and the mouthfeel is so creamy. The whole beer just turns to creamy head when I sip it, giving that spot-on feel that those Guinness widgets try to do. There's so much going on in the flavor - it tastes very good and doesn't get old. World class! A nice looking dark porter, not that dark, with a decent creamy head. I detect a caramel like malt aroma. It has a nice mild hop bite. Tastes more like an amber ale but the caramel and coffee undertones come through after more sips. Leaves a dry aftertaste. This isn't my favorite Left Hand beer, but it's a pretty good porter nonetheless. Has the requisite coffee and chocolate flavor of a porter, but not as smoky as some. Probably would go for their Milk Stout if given the choice between the two. The look is a glassy dark brown with a reddish hue. Thick, rocky head. Looks watery as opposed to thick. Nice but thin-looking. Light spiderweb lace. Nice roasted malt smell. Light toasted coffee taste with a sweet accent. Dry hops add a nice accent, though the hops are slight. Well-balanced. Very dry malt flavor. Roasted, bittersweet malt. Mild coffee and dark, semi-sweet chocolate. Really well-balanced between sweet and bitter. Has a "wet," watery feel for a porter, but with a syrupy finish. A bit more milky as it warms up. Very easy to drink. Bitter enough to warm your insides, but sweet enough to take the edge off. Poured from a bottle to a tulip glass. A: Not much head or lacing to speak of. Dark brown-red in color, transparent all the way through. S: Best part of this beer, unfortunately. I get a big cocoa/baker's chocolate smell up front, with a little bit of a sweetened coffee smell. None of the herbal hops that were advertised. T/M: This beer is kind of watery, and maybe I'm partial to stouts, but I've had some really full feeling porters lately that this just doesn't match up to. I do get some toasty coffee and some cocoa notes and the carbonation isn't overkill, but this beer doesn't have much lasting power. O: Maybe this beer was designed to be a session beer? I can't help but long for creamier, richer, more complex beers like Old Rasputin or Greenman's People's Porter after drinking this beer. Poured from a 12 oz. bottle into a standard pint. A: Very dark brown, if not black. Pours about a half finger, foamy, brownish head. Dissipates quickly and completely. Very sparse lacing remains. S: Dark, rich malt. Has a very subtle bubblegum sweetness to it. A little cinnamon toast kinda' thing workin' too. T: Dark roasted coffee malt. Slightly bitter, slightly sweet. A nice peaty hop bite. M: Full, robust body. Bitterness bites in the beginning, and a nice peaty twang hangs around through to the dry finish. Atmosphere is pretty solid. Appearance is nothing special, but a deep, rich tone, and a decent foamy head. Nose has an interesting combination of malt and a subtle sweetness. Flavor, the same. Malty, and thick, with just the slightest sweetness, and a bitter peaty finish. Overall, this is a really nice quaff. A- Poured a seemingly black body, exposes deep ruby red highlights when held up to the light. Thick creamy off white head that sticks around for ages. Thick lacing sticks to the side of the glass. S- A mixture of a sweet and roasted malt character. Hints of chocolate and coffee are present in the nose. Virtually no hop aroma. T- Very similar to smell. Sweet chocolate and caramel malts up front, quickly followed by a creamy/coffee flavor. The finish consists of a robust coffee flavor. Very complex and interesting. M- Very creamy and full. Thick bodied, goes down incredibly smooth.